Grief can be quite mysterious. One day it can feel like you are wrapped in a prickly shawl that makes you uncomfortable only now and then, when the prickles pinch you. Other times it can weigh you down like an iron wrap and slow you down for no reason at all. It snakes around and hides a spell and you may think that all must be fine, until it crawls out at the most inopportune time. It is a slow process and not one person experiences it exactly the same way but the roller coaster of emotions can make you nauseous sometimes and other times angry, sad, guilty and salty tears return again cleansing your heart. Sometimes I find grief is a bit like a leaky faucet. You know when, all you really need to do is change those worn out washers, but you don’t get around to it. The water may start leaking when you least expect it. Aw but laughter is cathartic and it can be a nice way to reminisce of past times, long ago and maybe an image will make you smile…a nice reprieve. November has been more palpable than former years. Once we passed a few weeks of rain, one gets the feeling that life is still hanging on. There are the odd trees with colourful leaves hanging proudly on their branches. It is almost as if nature is making a statement but it is difficult to interpret the meaning. The other day I noticed one tree on my way to work with half of the right side full of yellow leaves and the other half completely bare. I smiled as I passed by the tree and wondered how the wind and the rain worked in tandem to catch ONLY one side of the tree. “Nature works in mysterious ways sometimes”, I thought to myself, shaking my head. Yes, November seems less dark. Last week I looked out the window from my desk at work and I catch a glimpse of such beauty. No time to get to the rooftop for I may miss those warm colours. Yesterday, I saw this huge ball of fire dipping and the few seconds it took for me to aim my phone to that glorious scene, the sun had almost slipped completely below the horizon! How blessed I feel, sitting at my desk, watching the Great Spirit paints different shades with each brush stroke on His canvas. And despite listening to the struggles of youths on the phone, I am relieved we can give them a bit of hope and I feel the presence of something very powerful as I look out the window. I am thinking of the approaching days and the anniversary of my mother’s death As we approach this date, December 2nd, I feel myself slowly replaying that night by her side … her last moments here. I cannot help but wonder if it is because it is my mother. It is just as I replay the birth of my children the day before their birthdays even 30+ years later; I find myself also replaying the end of life with my mother. How blessed I was to be by her side. I love remembering times with my mother and talking about her with my children. They too have fond memories of her. Every time they smile and laugh at how funny she was. She was a bit like Lucille Ball only she was not acting! Depression can mean many things. We tend to overuse that word meaning, sad, moody, down in the dumps and wiped from work or school; all these last moments to days or weeks but depression is not quite the same thing. I remember seeing the face of depression when I was a teen for the first time. I observed the grey tint to her face, the emptiness in her hazel eyes and that consistent pout. Of course, what did I know at thirteen? I thought there was a cause and that was the effect. One person causing a broken heart, which in turn turned those hazel eyes into depression. And yet, I know now that it is far more complex than that. Yes, a broken heart is grieving a love that one had. I like to call all grief a “necessary depression”. And that sadness can conjure up old wounds and offer an opportunity to reflect and perhaps heal some of them. Depression does not have to be the result of a particular cause. It can surface for no reason at all outside of the person. “A chemical imbalance,” a doctor may explain. I remember getting calls from youths shocked that they could possibly be suffering from depression when they were in a loving family, they had good friends at school and they were doing will academically. But this does happen. Sometimes there is a genetic component that may increase the risks of depression. I also recall working in home-care and seeing some of my colleagues (nurses or personal support workers) who were suffering from “burnout”. I had not realized how that can creep into your life like a snake…very slowly. That may be why I never saw it coming for myself. Working at two part-time jobs, taking two courses per semester at university, member of school committees at my children`s school, along with other volunteer positions. I learned what it meant to “burn the candle at both ends”. Depression allowed me…no forced me…to take the time to reflect on my life. It was like I was driving on the expressway and never taking the time to stop and visit the towns along that highway. Depression forces you to take the scenic route, although you may not see it as charming at first. Truths are never too pretty to face sometimes but the weight alleviated makes your perception on life so much prettier. In a surprise episode of Chèvrefeuille’s Make the Haiku Complete, the goal is to add the first and third lines to the given middle line to complete the haiku. I thought it would be fun to choose two constellations that are best viewed in November such as Cassiopeia and Pisces. 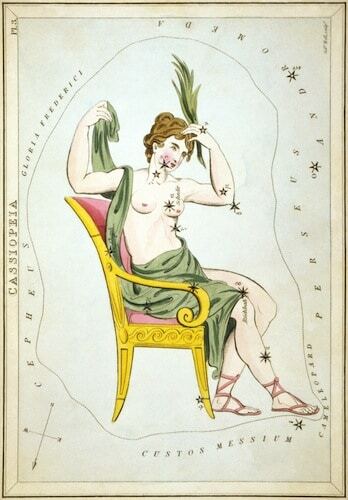 Cassiopeia, a vain beauty trying to catch Eros who is tied his mother Aphrodite…ha! good luck with that! I happen to be a Pisces as well and today is my son’s birthday. The following text is from Art of Manliness discussing 15 Constellations Every Man Should Know. The body remembers, they say. Last night after dinner around eight, her lower back was aching. They had just finished a birthday dinner one day ahead. Her son was born the following day at noon. When her guests left, she put an ice-pack on her back and rested on her comfy couch watching a new series “The Crown”. The series caught her attention in so many ways since her mother had her children during the same era Queen Elizabeth did and she was born in 1926 like her mother. Watching the children in those times, the fashion, the cars, brought her back to her own childhood. Reminiscing back and forth from her youth and bouncing back to when she gave birth to her firstborn was a memorable way to end her evening. She remembers, long ago, that soft throb coming from her lower back every fifteen minutes on her lower back and increasing with intensity over hours until she realized after midnight that this must be the beginning of her labour. Who really knows when it’s your first? Perhaps it is true…the body remembers and her backache was a subtle reminder of the joy of giving birth today to her son, thirty-eight years ago.